who ​want to help the poor in Thailand. We only need people whose prime aim is to "Unconditionally" help the people we serve in Thailand. We already have a small team of regular volunteers. 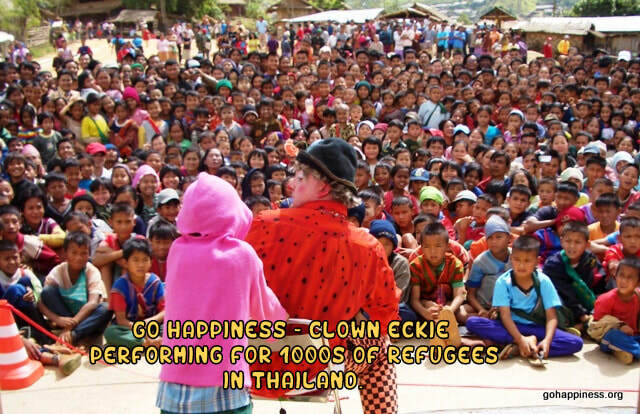 They are all happy to give their time and skills as part time administrators, accountant, drivers, computer nerds and of course the Founder/Director Eddie Haworth (AKA Clown Eckie) is the main entertainer. We are all dedicated to maximising the help we give to needy children in Thailand. 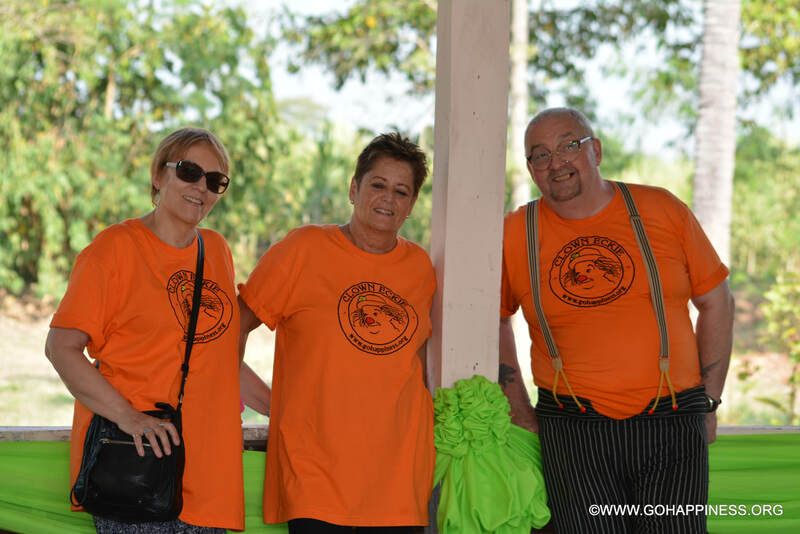 There are varying numbers of other part-time volunteers in Bangkok, Mae Sot, Chiang Mai, Kanchanaburi, Ayutthaya and Mae Hong Son and even Phuket. All these people support us whenever we have aid & show giving tours in their region, or to organise collecting, sorting and redistribution of donated goods in Bangkok. Want to Become a Genuine Volunteer to help the Poor in Thailand? There are a lot of charities that charge volunteers who want to volunteer for them. Understandably charities worldwide desperately need donations and have to get funding however they can, but we understand that paying to volunteer is not everyone's idea of lending a helping hand. Everyone reading this can share our News Page through social media, blog-sites, friends, school-friends or groups/work colleagues. (Start right now by sharing our Facebook page). Worldwide; Individuals, schools, University students offices, clubs and other groups can help to raise awareness and funding for our registered charity. Worldwide; Anyone visiting Thailand who can lend a hand by producing some kind of activity to help the people we serve during one or more of our monthly aid & show giving projects. "Anyone with a 'Party Piece'; like hula-hoop, blowing bubbles, interactive singing, dancing, juggling and any other simple silliness to make the children happy...."Or Report writing, helping with field-trip administration and book-keeping duties for those less willing to perform for the children". 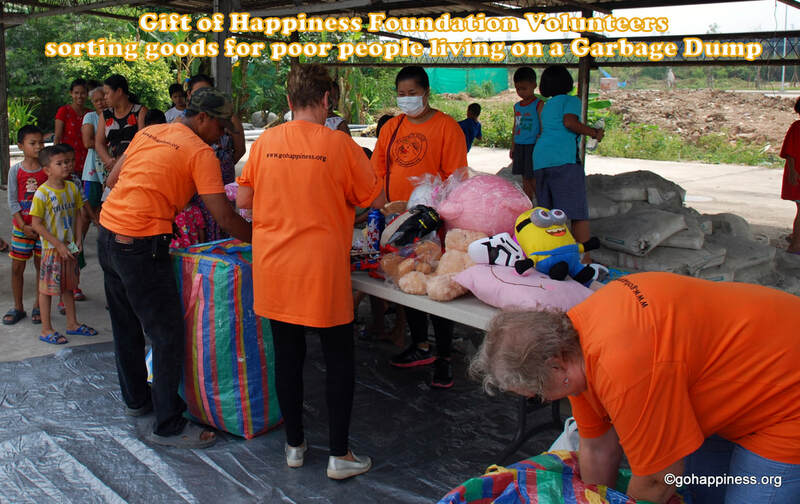 Bangkok; Donation sorters at the Go Happiness Centre in Bangkok. Bangkok & N. Thailand; Photographers and film-makers willing to allow us copyright. 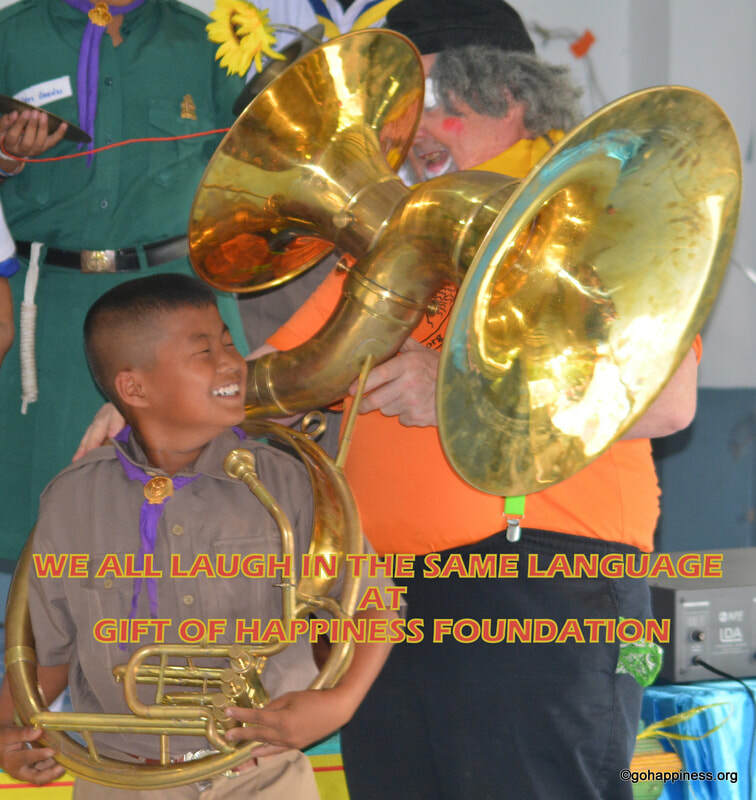 HAPPY Volunteers 'Give Happiness' at orphanages, schools and remote villages in Thailand. If you live outside Thailand and wish to help us from your own country. You can help us a great deal by simply telling your friends at work, school or social network about the work that we are doing here in Thailand. Then try to organise some kind of fund-raising events in your home town and donate the proceeds to our organisation. Professional entertainers with visual acts should have a good clean comedy act that you can present without the use of spoken language. Acts required are clowns, jugglers, uni-cyclists, acrobats, mime artists, magicians etc...(No language used in our shows…Unless you speak Thai or Sino-Tibetan family of languages). They have perform at slum schools, orphanages, hospitals and other places where children ordinarily would never get a chance to see these inane antics, or enjoy an afternoon of laughter and fun. The cheer and goodwill created is a priceless way to experience some of the 'real life' that expat's and visitors tend to overlook. We need musicians with portable instruments who can improvise around comedy shows. Acoustic musicians, brass, woodwind, percussion etc. Schoolchildren, local clubs, small companies and other groups often sponsor a show and also enjoy themselves with the other volunteers as 'Sponsoring Guests of Honour'. We can promise you a truly unique experience. You'll feel good, do some good, and remember it for the rest of your life...And so will the children! Send us a message with details of when you would like to sponsor a show and we will be happy to arrange it for you. 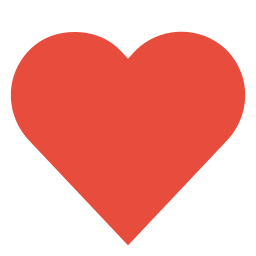 Sponsoring a show can really make a difference to HUNDREDS of people! *​Individuals or Groups passing through Thailand on holiday and want to have a unique holiday experience for themselves, friends or families. WE do not do Voluntourism and we are not operating any kind of travel agency at GoHF. *Individuals or Groups who consider our projects to be part of a fact finding mission to be used for other organisations or to gain personal merit. We are set-up only to serve very poor people in Thailand, not to boost the ego of more affluent individuals or provide organisations with knowledge on how to gain access to the people we serve. Warning; All news reports/articles, photographs or other intellectual property published by GoHF belongs only to GoHF. We consider any unauthorised use of such property as theft. The GoHF Lawyers offer free services to the charity and are more than willing to prosecute offenders! *Individuals or Groups motivated by trying to spread the word of any religions, political parties, new-age philosophies or extremist organisations amongst the people we serve or amongst the existing volunteers, staff and management at GoHF. Quote from About Us page; "We are a non-profit, non-religious organisation and have no affiliation with any political parties or extremist groups". *Students who are required to do some charity field-work for their study courses or are required to complete community service for graduation. Note; Students wishing to choose GoHF as a charity to fulfil such requirements may consider running some fundraising or goods collection programmes within their school/collage in return for references/appreciation certificates from GoHF. *Students who want a cheap way of travelling around Thailand during a gap-year. We do not run any student training programmes at Gift of Happiness Foundation. We are set-up only to serve very poor people in Thailand; Students who can help us do that unconditionally are welcome to apply.